First Thoughts The Dry isn't my typical go-to read as I usually reach for YA. But as soon as I delved into the blurb, the premise seemed more and more like a greatly welcomed change of pace for my reading habits. I was eager to see what Jane Harper's writing was like, also, because I had heard great things from Goodreads and given it's her debut, it was even more enticing. 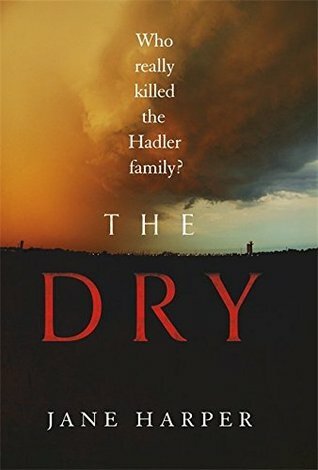 Review Set in a small town, The Dry began with a setting that immediately makes a mystery more interesting. Small towns are like a goldmine for a mystery and like the synopsis says, they certainly do have big secrets for such a small vicinity. Federal Agent Aaron Falk returns to his hometown after being called back to the town he fled years ago. His best friend from his childhood has killed himself after murdering his wife and child and Falk returns to attend his funeral. The town is reeling from the shocking scandal of the murder, although Falk can't help but think that there's more to this than meets the eye. He throws himself back to their childhood when his dead friend Luke and him hid another secret, but it only makes the situation more dire and he has to ask himself the question hanging in the air. Did Luke actually murder his family? Or is this tied to the secret from their childhood? I absolutely loved The Dry. It was compelling and eerie in the small town in the midst of a bad drought, alongside a puzzling mystery that bound together the lives and secrets of Aaron and Luke. The characters were vivid and believable, and I could honestly picture this being such an immensely powerful movie. The flashbacks put the present day secrets into a frame that kept the mystery going with slight tension and brilliant engaging charisma until the enthralling and startling end. Overall, Jane is surely an author to watch. The Dry is a five-star novel not to be missed! Mystery and Psychological-Mystery fans will be turning the pages in this like there's no tomorrow. Thank you for stopping by my blog for this day of The Dry Blog Tour! It's been an absolute pleasure. What did you think of The Dry?